Looking for a new soup recipe to add to your culinary repertoire? 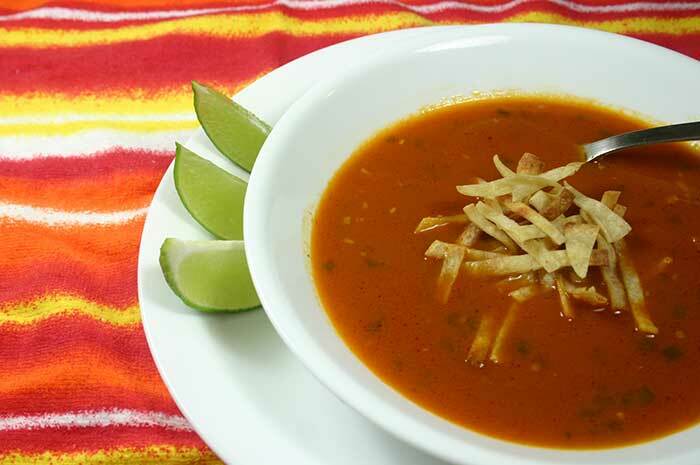 Try this rich, flavorful gluten-free tortilla soup with roasted tomatoes and onions. A couple of years ago during our annual pilgrimage to Maine, my stepdaughter and I went out to hit some of our favorite shops in Ellsworth. We picked a restaurant called The Mex for our girls’ lunch. We didn’t really expect good Mexican food in Maine, but it was one of the only downtown restaurants we hadn’t tried. Somehow we both ended up getting a bowl of soup with chicken and lime. I don’t think either of us spoke a word while we were eating (which is very unusual). We liked that soup so much, we innocently suggested to the guys that we have lunch at The Mex the next day, never confessing we’d already eaten there. This recipe reminds me of that tortilla soup. The one technique I really like about this recipe is the way you roast the vegetables. Roasting lends a depth of flavor that is difficult to achieve any other way. And the really nice thing is that you don’t even need to have tomatoes that are particularly ripe. Roasting brings out the flavor of store-bought tomatoes when “real” tomatoes aren’t in season. This is a thin soup; in fact, The Grillmaster thought it was too thin until he added some cheese. I liked the soup the way it was and didn’t think the cheese added much in the way of flavor or texture. (We don’t always agree on everything.) If you do like your soup a bit thicker, you can use the technique of adding some crushed baked tortilla chips as described in the recipe for Butternut Squash & Scallop Chowder. The jalapeños add heat and flavor, but they don’t make the soup mouth-scorching. If you’re timid about hot peppers, use green bell pepper instead. This soup is a good source of Vitamin C and Niacin. Make it vegan: Leave out the chicken and use vegetable stock in place of chicken stock. Also skip the cheese. Preheat oven to 450°F. Combine half of the olive oil (2 tablespoons), chili powder, cumin, and oregano in small bowl; stir until well blended and set aside. Line a jelly roll pan or cookie sheet with parchment paper. Spread tomatoes and onions in the pan in a single layer. Brush with the seasoned oil and roast for about 30 minutes, or until the tomatoes are soft and the onions have a few brown spots. Set aside to cool slightly. Reduce oven temperature to 400°F and line another cookie sheet with parchment paper. In a large bowl, toss the tortilla strips with 1 tablespoon olive oil. Spread them in a single layer on the cookie sheet and bake 10 minutes, stirring once, until they are crisp and browned. You may need to let them go for an additional few minutes. If so, keep an eye on them as they will get overly brown very quickly. Remove from oven and let cool. Scrape the tomatoes and onions into a food processor and purée until smooth. In a Dutch oven, heat remaining 1 tablespoon oil over medium heat. Add garlic and jalapeños. Cook, stirring constantly, for about a minute. Add stock and salt. Strain tomato/onion mixture into pot, stirring and pressing down to extract as much pulp as possible, leaving the skin and seeds behind. You may need to scrape the bottom of the strainer occasionally as lots of the good stuff seems to cling there. Bring stock/tomato mixture to a boil, then reduce heat to low, cover and simmer for 10 minutes. The soup can be made ahead to this point. Just before serving, add the shredded chicken and keep on the heat just until the chicken warms up. Place the avocado into a small bowl and squeeze several wedges of lime over it. Put the soup into serving bowls, then add some of the avocado/lime mixture, cilantro, tortilla strips and cheese, if using. Serve with remaining lime wedges. Make this recipe vegetarian by skipping the chicken and using vegetable broth instead of chicken stock. Make it vegan by skipping the cheese too. Delicious looking soup! Tortilla soup is one of my favorites. My dad makes a turkey broth that we add chopped avocado, onion, cilantro, cheese, and tortilla chips to. It’s super easy, but always yummy! Will definitely give this soup a go with the roasted veggies. Yum! Love the turkey broth idea! I’ll have to remember that after Thanksgiving. Looks awesome! I could live on Soup, I’ll have to put it on my list for this winter!